In last month’s column we discussed Rybka, the World Computer Chess Champion. This month we go all the way to the other end of scale and discuss Dinosaur Chess, a multimedia game for helping children learn how to play chess. 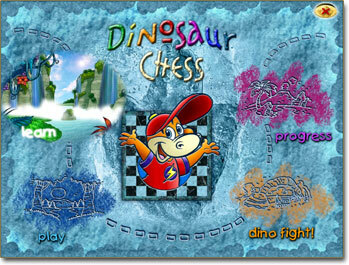 Dinosaur Chess is for the absolute beginner. As an example, it could be of great help to parents wishing to teach their child how to play chess. 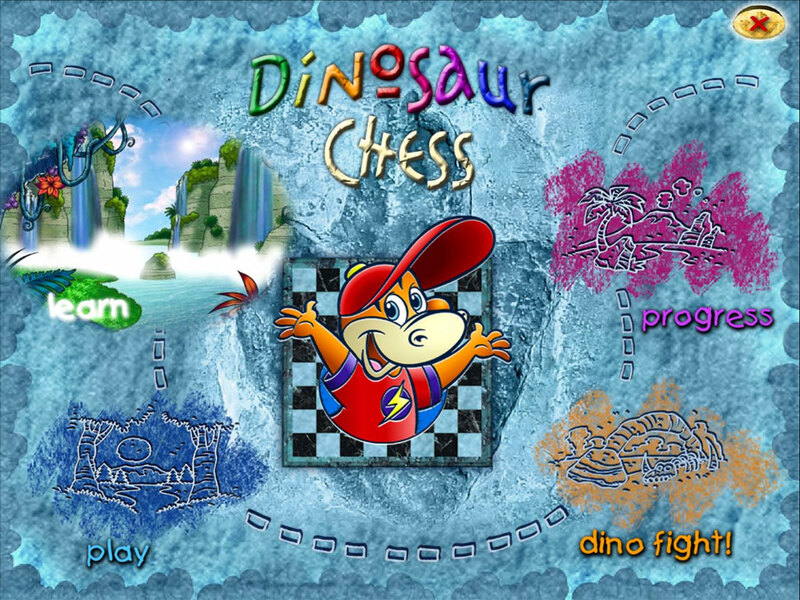 The main advantage of Dinosaur Chess is that it turns learning chess into a game of its own, making it a truly fun and inspiring activity. 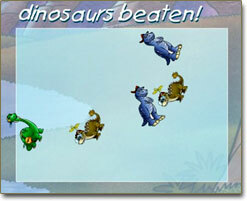 The Basic Premise As the name indicates the game is set in the age of the dinosaurs. Each player starts out as a very small dinosaur, either male or female, fresh from the egg. 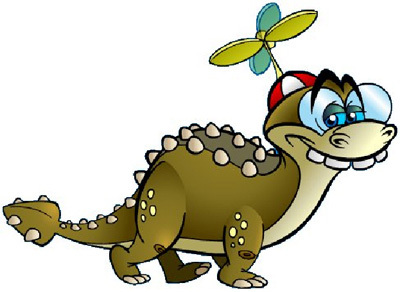 But being a very small dinosaur in a jungle full of very large dinosaurs has some severe disadvantages so the goal is to grow as quickly as possible. In this game there is only one way to get bigger and stronger: By learning something new about chess. Meet the Professor. Fortunately for the small, but ambitious dinosaur there is help to be had. Meet Professor MacDinosaur. 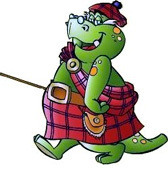 This English speaking dinosaur is clearly Scottish, as his name, outfit and strong Scottish accent indicate. The friendly professor will guide you through all the basics of chess and help you grow and get stronger until you can successfully take on the terrible Tyrannosaurus Rex. But as the professor himself says, it’s not only about getting bigger and stronger, but also smarter! Learn. Here you attend Professor MacDinosaur’s classes. Play. Play a game of chess against a dinosaur. Dino Fight. Have the chess lessons really made you bigger and stronger? Progress. Keeps track of your triumphs. Learn. This is where you attend Professor MacDinosaur’s classes. He offers 11 different interactive lessons. The first one teaches you all about the board and the squares. Next come 6 lessons where you learn the rules about the pawns and the pieces, how they move, how they capture the opponent’s pieces etc. After that there is a special lesson about castling. The final three lessons teach you about winning, losing and drawing, the values of the pieces and finally you are given various hints and tips to help you with your game. The lessons cover everything needed for a person, who has never seen a chess board before, to play a game of chess. This image is taken from the lesson on the knights and shows the part of the screen where all the action takes place. I will use it to explain how the lessons are structured and what options are available during the lessons.The red bar at the bottom of the image is split into several buttons. Lessons. If you click on this button you can choose another lesson from a list of all available lessons. The first time you go through the lessons you must take them sequentially, although you can review a lesson that you have already completed at any time. Pieces. You can select from several different piece sets and board designs. Clicking on this button switches to a new design. Replay. Restart the current section of the lesson. Back & Next. The back button switches to the previous section of the current lesson in case you want to review it. The next button starts the following section. You’ll be using that button quite a lot, because the next section doesn’t start until you are ready and click on this button. When it’s time to continue, the button flashes so you’ll always know when the current section is over. In addition to these 5 buttons there is one additional button (“Hint”) that is displayed only when you are solving an exercise. 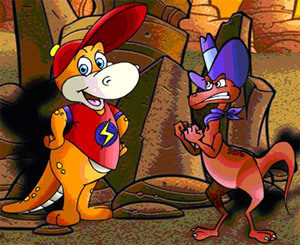 Click on that button if you are stuck and Professor MacDinosaur will come to your rescue.The chessboard in the image above shows an example of a simple exercise. 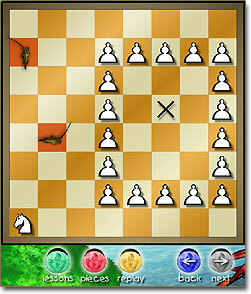 Your task is to find a way for the knight in the corner to reach the square marked with an X. 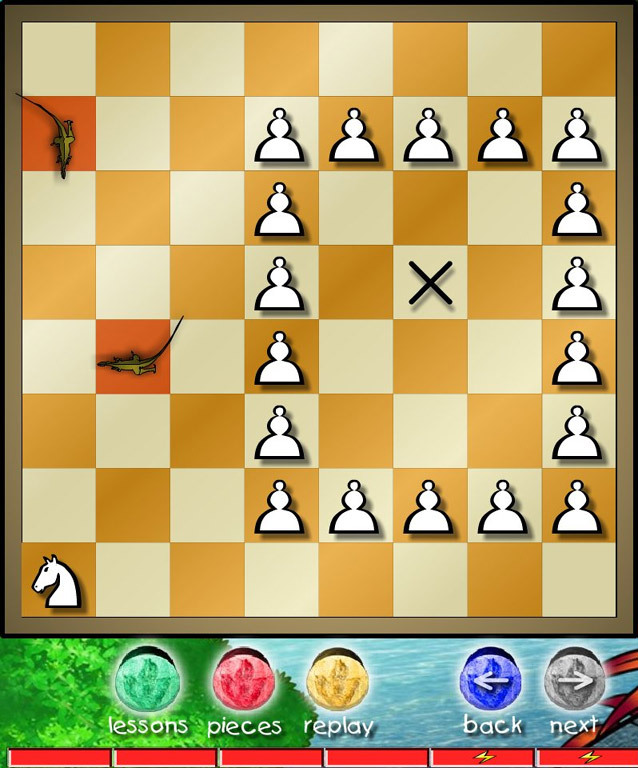 So this exercise reinforces what Professor MacDinosaurus has taught you about the knights – how they move and how they can jump over other pieces and pawns. You are probably wondering what the two creatures are doing on the chessboard. They are raptor guards patrolling the board looking for chess pieces trying to enter the pawn fortress. You better keep away from those fellows as a knight is no match for them. So you need solve the exercise as quickly as possible. The limited knowledge of the different dinosaurs can be very helpful for the absolute beginner. He only needs to learn about the pawns and the king before starting to play against the Ankylosaurus. Other dinosaurs are handicapped in different ways, so as you learn more you will always be able to find a suitable opponent. Only Tyrannosaurus Rex, the king of the dinosaurs, has mastered all the pieces. Restart. Abandons the current game and starts a new one. Pieces. As in learning mode this button selects a new board design. Undo. Clicking on this button takes back your last move. Score. 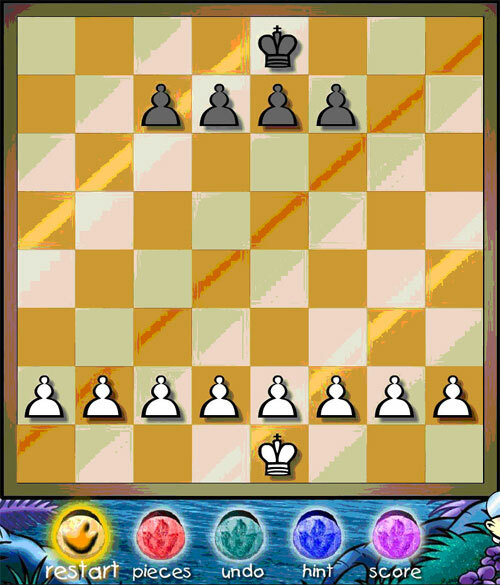 Shows the pieces that you and your opponent have captured. Dino Fight. As the goal of learning chess is to get bigger, stronger and smarter it is natural that the learning dinosaur wants to try himself against the other dinosaurs off the board, too. That’s what Dino Fight is for. Of course it is not chess, but it symbolizes the program author’s believe that chess is good for you, and that kids especially benefit from learning and playing chess. 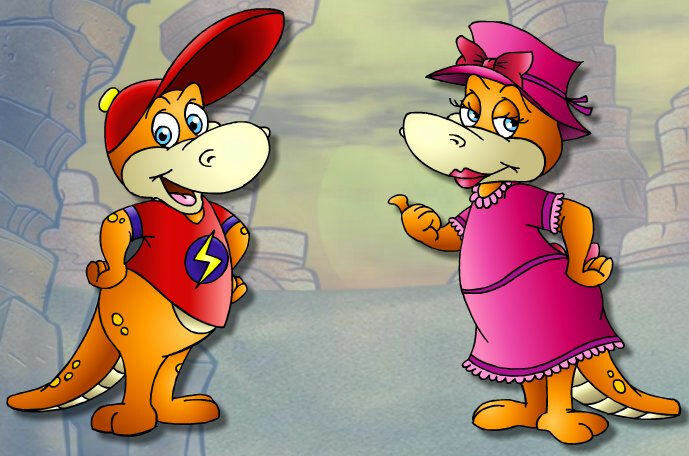 You will find that fighting against the stronger dinosaurs is hopeless, until you’ve attended most of the lessons from Professor MacDinosaur. However, after you have learned all the tricks from the professor you will see that even the terrifying Tyrannosaurus Rex is not invincible. Progress. Progress mode displays an overview of what you have achieved so far. It doesn’t use traditional methods for displaying such information. 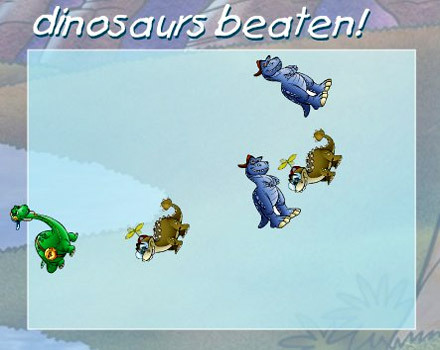 If you have, for instance, managed to beat some of the dinosaurs at a game of chess, images of the opponents you have beaten are displayed floating around in the frame “dinosaurs beaten”. Progress mode also shows how many lessons you have successfully finished, how many pieces you have captured and how many fights you have won.One of the nice features of Dinosaur Chess is that it can keep track of several different players. So if you want to use the program to teach more than one child they can be registered as separate players and the program will keep track of the progress of each one of them.If you want to introduce a child to the game of chess, Dinosaur Chess could be a good choice as it makes learning chess fun and thereby makes it more likely that the child will want to continue playing, learning and improving.